Faith is a sheer gift of God, which we receive when we fervently ask for it. I wanted it to be real, but somehow there were things holding me back. This past Ash Wednesday someone traced an ash-cross on my forehead with the words, “Repent and believe in the Gospel” and it struck me: do I really believe? Like really believe? Anyone can believe that Jesus existed, just anyone can believe in the existence of any historical character. It’s not that hard to say you follow Him, either. But what if I really believed these words of giving all you have and leaving everything behind? What if when He said I could move mountains if I had the faith the size of a mustard seed I brazenly approached mountains all like, “You. Move.” What if I believed all the way that His plans were the best and didn’t second-guess out of fear? What if when I felt the urge to approach someone and speak love to them, I nodded to the Holy Spirit instead of chickening out? So, I had an idea and I made my office-mate participate. Every day I would read the Gospel and we would pick one line to write on a sticky note. We would reflect on that line and post it to the wall behind my desk. And, we did. Easter approached and the words of Jesus warmed my office. I wanted to know Jesus better, deeper. I wanted His words surrounding me so they could soak into my soul. Sometimes I feel like there is a Jesus we construct, a Jesus we want, much like the disciples who consistently look for a Jesus who answers all of their dreams. By the time Easter Vigil 2012 arrived, I heard the words of the creed and was struck by how much I did believe and agree with them. Somehow, our little prayers of repentance and faith had translated as faith in my heart. The wall had reintroduced me, in some ways, to Jesus. 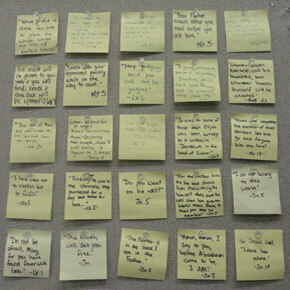 I had asked in simple, sharpie-written prayers on sticky notes. The format of this faith wall reminds me of the work I do. When we see things written in front of us…staring back at us it sort of reinforces lessons in our lives. Love this! And I especially loved the piece about “he keeps giving me better dreams.” I understand that. God is faithful indeed! Thanks for sharing.